Last year, an interdisciplinary group of Duke faculty led by Poss received an Intellectual Community Planning Grant to foster communication among researchers, engineers, clinicians, and experts in order to advance regenerative biology and medicine. Funded through the Together Duke strategic plan, Intellectual Community Planning Grants give faculty the chance to convene a group of colleagues to begin or test a new collaboration around a shared interest. Sharlini Sankaran is the executive director of Regeneration Next; she provided an update on the activities supported by the grant, excerpted below. Our goal was to enable better communication amongst researchers, engineers, clinicians, and experts, and ultimately to support effective translation of tissue regeneration research to potential treatments in an ethical and safe manner. Potential outcomes we hoped for include recruitment of new faculty, formation of new collaborative teams and centers of research for regenerative medicine, and/ or securing new funds for collaborative research. Accordingly, we expended the grant funds in two ways: to build multidisciplinary research communities at Duke, and to increase recognition of Duke’s regenerative medicine strengths. We convened small groups of basic scientists, clinicians, and researchers around the tissue- and disease-specific topics of heart, musculoskeletal, and cancer-related regeneration. In addition, we sponsored a faculty talk on lung regeneration by Duke faculty member Purushothama Rao Tata and regularly held faculty chalk talks to foster discussion and collaboration. The faculty subgroup meetings have led to some exciting outcomes. We are pleased to report increased collaboration and formalization of interdisciplinary disease- and tissue-specific regenerative biology and medicine communities at Duke. The groups that we have seeded are continuing to grow and form new relationships and potential collaborations, as self-reported by faculty members. 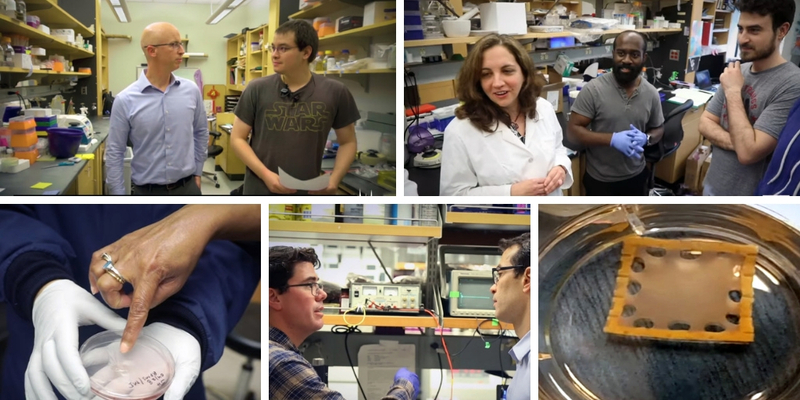 We’ve produced short videos showcasing breakthrough research by faculty in three of these subgroups: heart regeneration, musculoskeletal regeneration, and brain and nervous system regeneration. I’ll focus on a case study of outcomes following a September 2017 meeting of basic scientists, cardiologists, cardiac surgeons, and biomedical engineers with interests in heart regeneration. The group identified the following barriers toward translation of basic research to treatment: a lack of expertise in gene therapy, a lack of expertise and research into heart regeneration in large mammals (a necessary step to translate research findings in small animals like fish and mice closer to human patient therapies), and a lack of targeted funding for these efforts. As a result of the discussion, Regeneration Next initiated a collaboration between several entities toward the successful recruitment of Dr. Aravind Asokan, an expert in gene therapy and viral vectors, from UNC to Duke. Asokan is director of a new gene therapy group in the Department of Surgery. (See a related interview with Aravind Asokan.) In addition, the group submitted a pre-proposal to the Department of Defense for establishing a large mammal center for heart regeneration. While the initial proposal was not funded, it has resulted in a plan for submitting an NIH program project grant to fund heart regeneration research at Duke. Regeneration Next was the only research-based, cross campus initiative represented at the event, which mostly featured hospitals and community advocacy groups. 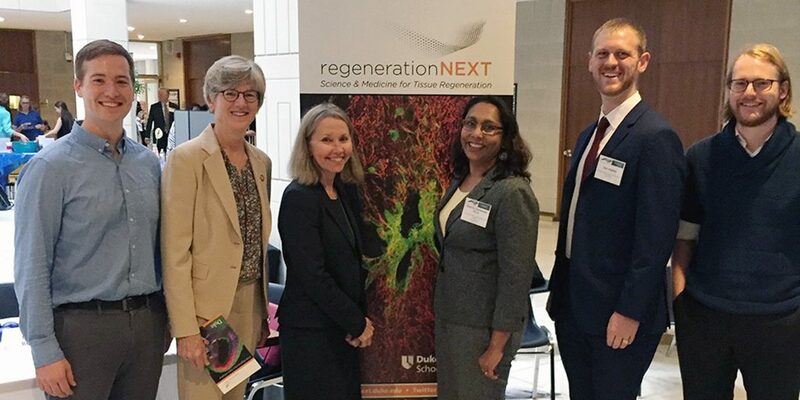 This event presented an opportunity for local policymakers to hear about tissue regeneration research at Duke, and allowed graduate students who are interested in science policy to interact with policymakers and advocate for support of basic science research. 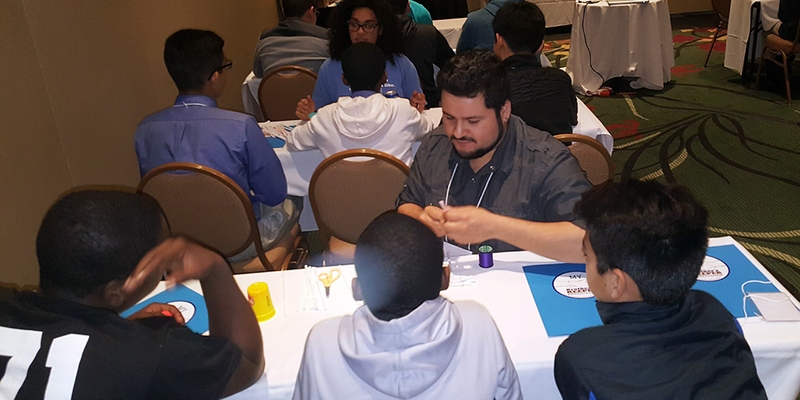 We also took part in a science education outreach event for minority young men coordinated by the City of Durham. (See a related post by graduate student Ariana Eily.) The event was hosted by Made in Durham, a nonprofit helping young people graduate from high school, go to college, and be prepared for their careers, and My Brother’s Keeper Durham, a branch of President Obama’s mentoring initiative. The Intellectual Community Planning Grant allowed us to form collaborative small groups with common interests in specific organs, biological systems, and/or diseases. The work seeded by the grant continues with successful faculty recruitment and collaborations resulting in submission of large, multidisciplinary research proposals. In addition, we have formed a deeper connection with state policy makers, the North Carolina STEM education community, and Duke Development – leading to increased awareness of and ongoing conversations about policy and advocacy in tissue regeneration and regenerative medicine in North Carolina and beyond. Read the Intellectual Community Planning Grants 2017 report and learn more about Together Duke initiatives.